Electrophile and Nucleophile are the two important concepts in organic chemistry that help describe the chemical reactions between electron acceptors and donors. These two terms were introduced in 1933 by Christopher Kelk Ingold and they served as replacements for cationoid and anionoid terms which were introduced in 1925 by A.J. Lapworth. Since then, extensive studies were undertaken to understand the different between electrophile and nucleophile. This article demystifies the difference between these two concepts. In a nutshell, a nucleophile is an electron donor whereas an electrophile is an electron acceptor. To breakdown the term, the word “electro” is from electrons and the Latin word “phile” refers to “loving”. In simple terms, it means electrons-loving. It is a reagent that is characterized with a low density of electrons in its valance shell, and, therefore, reacts with a high-density molecule, ion or atom to form a covalent bond. Hydrogen ion in acids and methyl-carbocation are examples of electrophilic substances. They are electron deficient. An electrophile is easily detected by a positive charge or neutral charge with empty orbitals (not satisfying the octet rule). Electrons move from an area of high density to the one with low density, and unlike charges attract each other. This theory explains the attraction of electrons by the electron-deficient electrophile atoms, molecules or ions. By definition, an electrophile is interchangeably called a Lewis acid as it accepts electrons in line with the definition of the acid. In general, an electrophile is identified by a partial positive charge as in hydrogen chloride, a formal positive charge as in methyl carbocation or vacant orbitals. Polarized neutral molecules such as acyl halides, carbonyl compounds, and alkyl halides are typical examples of electrophiles. Important: Hydronium ion, although it bears a positive charge, does not qualify to be classified as an electrophile due to the full vacant orbitals in its outer shell. It yields hydrogen ion and water. The same applies to the ammonium ion; it does not have vacant orbitals that can attract electrons. As a result, it is not an electrophile. The term is broken down into the word “nucleo” which refers to the nucleus and the Latin word “phile” which means loving. It simply means nucleus loving. Nucleophiles are rich in electrons and, as thus, donate electron pairs to electrophiles to form covalent bonds in chemical reactions. 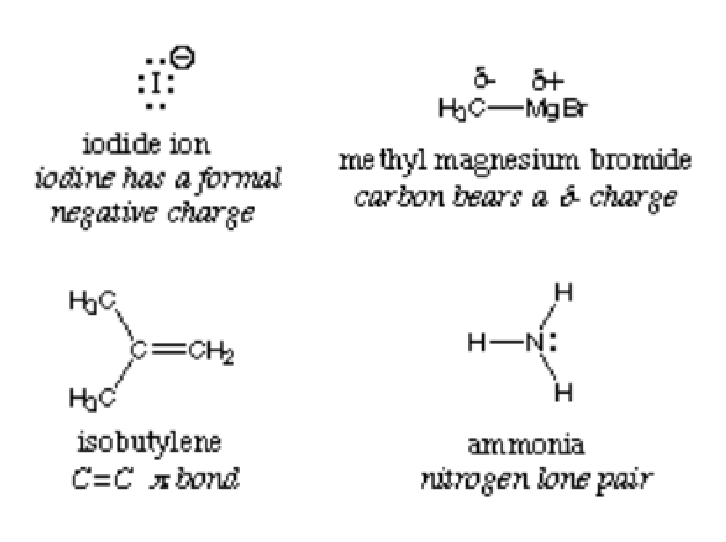 These substances are best noticed with lone pairs, pi bonds and negative charges. Ammonia, iodide and hydroxide ions are examples of nucleophile substances. The nucleophilic center in a compound is detected with the most electronegative atom. Consider ammonia NH3; the nitrogen is more electronegative and thus draws electrons to the center. The compound has high electron density and, when reacting with an electrophile, say water, it donates electrons. H2O can act both as the electrophile or the nucleophile depending on the compound or molecule it reacts with. From the picture, the first atom, chloride ion is donating its lone pair to carbon to form a covalent bond. It has the negative charge and donates electrons, and so it is regarded as the nucleophile. That chlorine atom that is leaving the chlorosulfite ester is named the leaving group. It is not an electrophile or a nucleophile. An electrophile is a Lewis acid that accepts electrons from an electron-rich atom, ion or molecule. By accepting electrons, it forms a covalent bond. This reagent often identified by partial positive charge, formal positive charge or a neutral atom, ion or molecule that does not satisfy the octet rule. A nucleophile, on the other hand, is an atom, ion or molecule that has a high density of electrons. It donates a lone pair to the electrophile to form a covalent bond. It is identified by positive charges and free electrons in its orbital. A nucleophile is involved in nucleophilic substitution and addition whereas an electrophile is involved in an electrophilic substitution and addition. 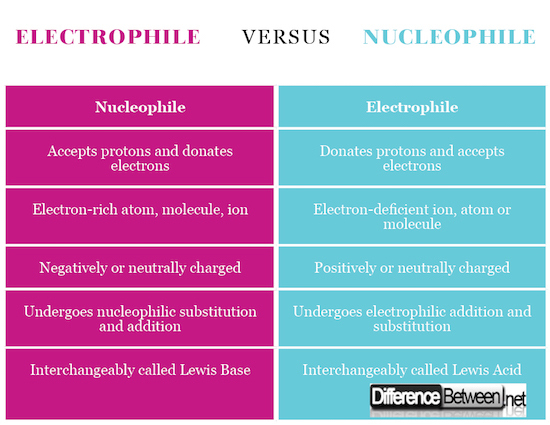 An electrophile can be neutrally or positively charged whereas the nucleophile can be neutrally or negatively charged. An electrophile accepts electrons hence it is referred to as the Lewis acid whereas a nucleophile donates electrons hence it is referred to as the Lewis base. An electrophile accepts electrons and donates protons while a nucleophile donates electrons and accepts protons. Lusi Madisha. "Difference Between Electrophile and Nucleophile." DifferenceBetween.net. April 12, 2018 < http://www.differencebetween.net/science/difference-between-electrophile-and-nucleophile/ >.